^ Oswald, Andrew J. (2007). "An Examination of the Reliability of Prestigious Scholarly Journals: Evidence and Implications for Decision-Makers". Economica. 74 (293): 21–31. doi:10.1111/j.1468-0335.2006.00575.x . ^ Northrup, Cynthia Clark (2004). "American Economic Association". The American economy: a historical encyclopedia. 2. ABC-CLIO. pp. 9–10. ISBN 1-57607-866-3 . ^ "Prestigious economics magazine calls Pittsburgh home". Pittsburgh Post-Gazette. April 18, 2007. ^ "AEAweb: RFE". rfe.org. Retrieved 6 April 2018. ^ Arrow, K. J.; Bernheim, B. Douglas; et al. (2011). 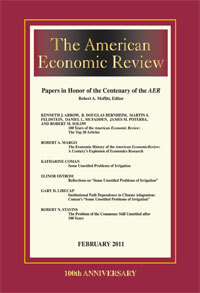 "100 Years of the American Economic Review: The Top 20 Articles". American Economic Review. 101 (1): 1–8. doi:10.1257/aer.101.1.1. ^ "American Economic Association - Journals of the Association". Vanderbilt.edu. Retrieved November 10, 2010.